July 10, 2017 (WASHINGTON, DC) — Today at a briefing on Capitol Hill hosted by the Congressional Primary Care Caucus, the Patient-Centered Primary Care Collaborative (PCPCC) unveiled its latest report highlighting new evidence that links the patient-centered medical home (PCMH) and other forms of advanced primary care with improved outcomes, but not in every study examined. 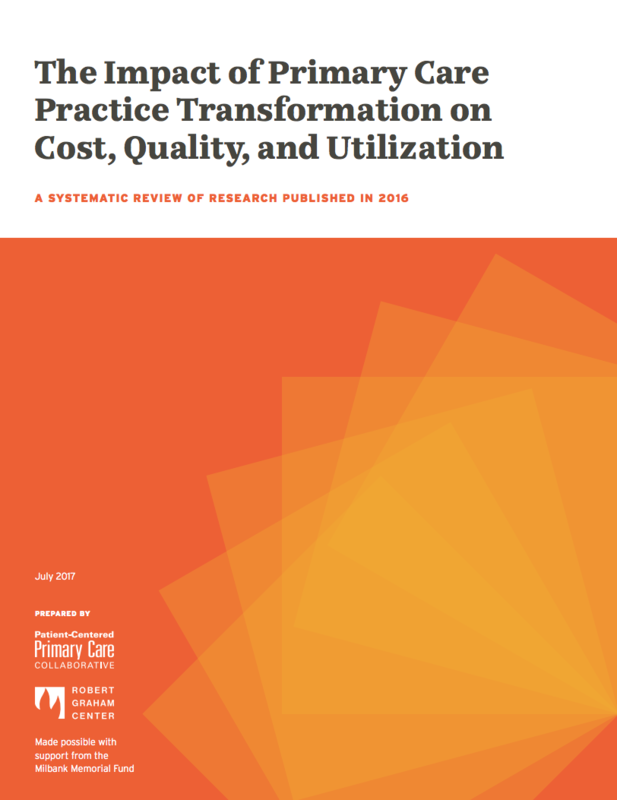 The Impact of Primary Care Practice Transformation on Cost, Quality, and Utilization reviews PCMH results from 45 peer-reviewed reports and additional government and state evaluations. Implementation of the PCMH and high performing primary care differs depending upon the needs and preferences of those delivering, receiving, and paying for related care. The sixth annual PCPCC report, authored by the Robert Graham Center of the American Academy of Family Physicians and published with support from the Milbank Memorial Fund, employed broader search terms and more rigorous search criteria that evaluated studies, reports, and evaluations published between November 1, 2015 to February 28, 2017. It also features examples and data from PCMH programs, such as Blue Cross Blue Shield of Michigan, which leads one of the oldest PCMH programs, now in its eighth year with seven years of data; the Comprehensive Primary Care Initiative launched by the Center for Medicare and Medicaid Innovation; and state primary care initiatives including Colorado, Minnesota, and Oregon. “It is vital to continue studying and evaluating what is and is not working with primary care transformation, given the impact it has to improve patient outcomes and the investment on the part of the federal government, states, and commercial payers in PCMH and other strategies to advance primary care,” said Christopher F. Koller, President, Milbank Memorial Fund. Speakers at the briefing include: Ann Greiner, Patient-Centered Primary Care Collaborative; Justine Handelman, Blue Cross Blue Shield Association; Dr. Yalda Jabbarpour, Robert Graham Center/Georgetown University Department of Family Medicine; Christopher F. Koller, Milbank Memorial Fund; Dr. Jean Malouin, Blue Cross Blue Shield of Michigan Value Partnerships; and Dr. Gregg Stefanek, Covenant Healthcare. The report was funded by the Milbank Memorial Fund, and the event was sponsored by the Blue Cross Blue Shield Association. Founded in 2006, the Patient-Centered Primary Care Collaborative (PCPCC) is a not-for-profit multi-stakeholder membership organization dedicated to advancing an effective and efficient health system built on a strong foundation of primary care and the patient-centered medical home. Representing a broad group of public and private organizations, the PCPCC’s mission is to unify and engage diverse stakeholders in promoting policies and sharing best practices that support growth of high-performing primary care and achieve the “Quadruple Aim”: better care, better health, lower costs, and greater joy for clinicians and staff in delivery of care. The Robert Graham Center staff is made up of a group of clinician researchers, as well as a variety of social scientists from sociologists to geographers to economists. Our aim is to improve individual and population healthcare delivery through the generation or synthesis of evidence that brings a family medicine and primary care perspective to health policy deliberations from the local to international levels. The Milbank Memorial Fund is an endowed operating foundation that works to improve the health of populations by connecting leaders and decision makers with the best available evidence and experience. Founded in 1905, the Fund engages in nonpartisan analysis, collaboration, and communication on significant issues in health policy. It does this work by publishing high-quality, evidence-based reports, books, and The Milbank Quarterly, a peer-reviewed journal of population health and health policy; convening state health policy decision makers on issues they identify as important to population health; and building communities of health policymakers to enhance their effectiveness.